Tribhuvan University is the oldest public university in Nepal. It was established in 1959. It is the 9th largest university in the world in terms of enrolment. TU marked its golden jubilee in 2009 organizing programs. It has different governing body among which TU service commission is one of them. 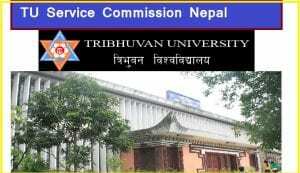 TU service commission is one of the important body of TU which is responsible for the recruitment of academic and non-academic staffs for the University. If there is any vacant in the University then, TU service commission is responsible for offering the vacancy advertisement and selecting the right candidates to the University. TU is the first national institution of higher education in Nepal. It is situated in Kirtipur with an area of 154.77 hectares. It has 39 central departments and 4 research centers. It offers 2079 undergraduates courses and 2000 postgraduates program. Currently, it has 60 constituent campuses and 1084 affiliated colleges in Nepal. It is public university governed by the government of Nepal. So, it is less expensive than others. Prime Minister is the ceremonial chief, the chancellor of the University, The ministry of education is the pro-chancellor and the CEO of the University is Vice Chancellor. To administer competitive written examinations and interviews for the applicants who wish to enter the university service and recommend the successful candidates for appointment to positions of teaching and administration. To administer required examinations for teachers and administrative staff of the university for their promotion and recommend the successful candidates for the appointment. Here is some information about Board of a member of TU service commission. This information is based on the official site of TU. Prof. Kedar Nath Ghimire, Ph. D.
Beside service commission, there are four councils that are responsible for major decision making in the University. It is responsible for executing the decision made by a senate, providing the affiliations to private colleges, recruiting the university officials, making decision on grants. It has 7 members. It is responsible for making decision related to educational policies, curricula, teaching, examinations and research. It has 50 members. It is responsible for formulating policies on TU research activities, approving guidelines for researchers and coordinating the functions of university level research organizations. Centre for Research is the secretariat of the council. It consists of 27 members. The planning council�is responsible for preparing short and long-term plans, developing annual programmes and evaluating the implementation of programmes. It consists of 29 members.